Earlier this month, the Touchwood team handled the 2015 SOCAN Awards red carpet. Some great Canadian music talent came out, including The Guess Who and Bachman-Turner Overdrive rocker Randy Bachman, City and Colour’s Dallas Green and chart toppers Magic! and The Weeknd. While many of us are familiar with big-name homegrown talent, Canada also has an awesome indie music scene to be proud of. Since I used to blog about music in my past life, I thought I’d share some of my favourite lesser-known Canadian indie acts who are making waves at this summer’s music festivals. Alvvays – This band’s self-titled debut album is my current obsession; there is just something about their lo-fi, dreamy brand of indie rock that screams summer. (Maybe it’s because the video for “Archie, Marry Me” takes place on a sail boat?) 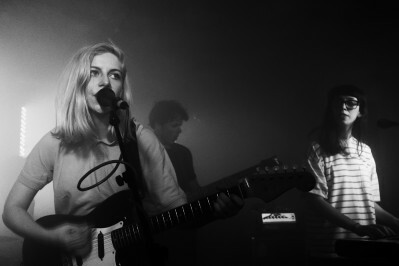 After playing the Indie Awards during Canadian Music Week, Alvvays is taking over the festival scene this summer with shows at Ottawa Blues Fest, WayHome, Osheaga and Squamish Valley Music Festival. They were also just long-listed for the Polaris Music Prize! Seriously, just listen to their whole album, it’s amazing. July Talk – The indie music gods were definitely at work during this band’s chance encounter: frontman Peter Dreimanis was sitting in a Toronto bar where an acoustic guitar was being passed around, but didn’t pay much attention until he heard Leah Fay start singing. He immediately started dreaming up what they’d sound like together, and July Talk was formed. The contrast in their voices and presence is what makes July talk so engaging: while Fay’s voice is soft and sweet, Dreimanis’ is coarse and aggressive. Check out their video for “Guns + Ammunition” and catch them this summer at the Calgary Stampede or WayHome! Brave Shores – You may not have heard of them yet, but I guarantee you’ve heard their biggest hit “Never Come Down” which has been featured in a bunch of commercials. (Indie artists have to pay the bills too!) Brave Shores is infectious indie pop at its finest. I caught their high-energy show during Canadian Music Week, and am looking forward to seeing them next at WayHome. This band is also local; look out for shots of the Toronto Beaches in their video! Dear Rouge – This husband and wife duo is made up of Vancouver natives Danielle and Drew McTaggart, which might also make them the most adorable band on my list. They channel Metric with their dance-rock hit “I Heard I Had” which climbed the alternative and rock charts before Dear Rouge was even signed to a label. The band is playing at a number of festivals this summer, including Ottawa Blues Fest, WayHome and Squamish Valley Music Festival! Lowell – Originally from Calgary, Lowell moved to Toronto at age 18 to pursue music. In 2014, she was signed to Arts & Crafts, joining lablemates like Canadian indie music royalty Broken Social Scene and Feist. There, she released her debut LP, We Loved Her Dearly, featuring the electropop hit “The Bells.” This summer, you can catch Lowell performing at Ottawa Bluesfest, WayHome and Wolfe Island Music Festival. Now get out there and see some great Canadian indie bands this summer!